Kate Garraway wears green, white and black striped ZARA dress on Good Morning Britain | HELLO! March 12, 2018 - 19:08 GMT Laura Sutcliffe Kate Garraway looked incredible on Friday morning when she presented Good Morning Britain in a green, white and black striped dress by high street chain ZARA. The £25.99 dress is part of the store’s current season. Kate Garraway wore a dazzling dress from high street store ZARA on Friday morning as she presented Good Morning Britain and it has proved to be a big hit with fans. 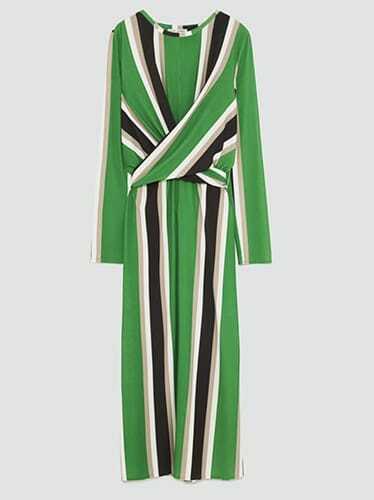 The fabulous design featured green, white and black stripes and was cut in a super-flattering midi cut. The dress also skimmed her trim and svelte shape, making the most of her lean curves. The striped number is priced at a hugely affordable £25.99 although it has sadly sold out online, it's currently in available in stores now. The married mother-of-two looked typically radiant; her hair was blow dried in a sleek and straight style and her makeup was flawlessly applied with a natural finish. The 50-year-old uploaded a snapshot of her 'outfit of the day' on to her hugely popular Instagram account and the photo generated an abundance of comments from the presenter's followers praising her latest look. Kate mentioned in the caption underneath her picture that comically, her co- presenter Ben Shephard thought the dress looked like a stick of rock! The mother-of-two loves the Spanish high street store and often wears many items from the brand. Last week when she attended the Global Awards in central London – she decided to wear some glamorous statement jewellery. She choose a pair of shoulder-grazing earrings which are priced at an affordable £12.99! The square, two-tone dangle earrings are made in striking red and black and feature push back clasp. The Good Morning Britain star is styled by Debbie Harper who turns her hands to an abundance of daytime TV stars, including Susanna Reid and Charlotte Hawkins. The stylist goes by the name 'Debbie Dresses' on Instagram and often documents her clients fashionable looks daily on her social media platform. Debbie's incredible work has a distinctive high street influence; all her outfits she puts together feature affordable, brightly coloured pieces that are readily available and purse- friendly, which is great news of fans of the ITV stars' obtainable looks.